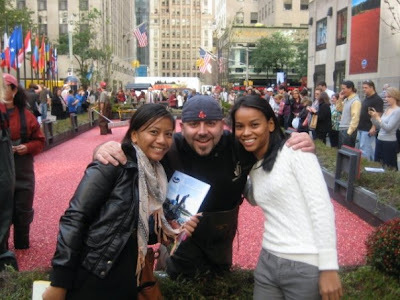 A couple of weeks ago, Ocean Spray kicked off it's 2009 "Bogs Across America" tour in Rockefeller Center in New York City with their "Big Apple Bog," a 1,500-square-foot free-standing cranberry bog that was constructed and filled with more than 2,000 pounds of cranberries. Under normal circumstances, an event centered around cranberries would be an event I'd skip due to my odd cranberry allergy. However, thanks to my awesome friend Grace, I was offered the opportunity to interview Duff Goldman from the Food Network's Ace of Cakes, who had created the cake for the celebration of Ocean Spray's 80th anniversary. Of course, I agreed to the interview (who wouldn't??) and made my way over to Rockefeller Center. After securing the samples, I walked over to the bog to secure a spot to watch as Duff, Geof, and crew put the finishing touches on the cake. You can see the camera crew standing in the bog with everyone else in some of my pictures. So, yes, they were filming for Ace of Cakes! By now, quite a crowd had formed in Rockefeller Center. At first, people just wandered over to see whether the bog was filled with real cranberries and whether it actually had water it in. (Hands dipped in and out of the bog to find out.) But when people started realizing who was actually standing in the middle of the bog, more people decided to stay and watch. As expected, I had a better view of the cake from the other side of the bog. I managed to get the "before" picture but was laughing too hard at Duff's reaction to get the "after" picture. After doing a little dance in the bog, he gave the crowd two thumbs up. Duff's a cranberry fan. Then, at long last, the cake was ready to be presented. After the presentation, Grace and I made our way over to the "holding pen" for the bloggers who were scheduled to meet and interview Duff. While we were waiting for our turn, we chatted with Ocean Spray grower Adrienne Kravitz. Cranberries are grown in Massachusetts; New Jersey; Wisconsin; Washington; Oregon; and British Columbia, Canada. The soils and temperatures of the above-mentioned areas are ideal for cranberry growing, especially since cranberries need cold temperatures at night. Cranberries have more antioxidants per gram than any other fruit, including blueberries. White cranberries are harvested in August, while red cranberries are harvested between late September and early November. Cranberries are full of air, which is why bogs are flooded with water when harvested -- they float right to the top. This last fact totally explains why some of the Ocean Spray growers, including Adrienne, were pelting Duff with cranberries earlier in the day. They were demonstrating that the cranberries really do bounce! But, seriously, Duff was just as fun and friendly in person as he is on television. When asked what he loved best about New York, he admitted to being a "huge Rangers fan" and that he loved "hanging out in Chelsea Market" and stopping by the Food Network offices unannounced. When he's not making trouble by making prank calls to those working at the Food Network, he spends a great deal of time out in Brooklyn visiting a good friend of his and his friend's family. I asked Duff how he got the inspiration for the Ocean Spray cake, and he told me that he and a bunch of other folks from Charm City Cakes went out to a cranberry bog in New Jersey and learned as much as they could about cranberries and about harvesting them. Duff operated as much of the machinery as they would let him near and participated in the actual harvest of the fruit. To prove that he was listening to what the growers were telling him, Duff told us that "cranberry plants are trained to grow flat so they aren't ripped out of the ground by the harvesting equipment." The Ocean Spray growers standing nearby nodded their heads and confirmed that he was right. Way to go, Duff! Grace and I asked him what he favorite flavor or variety of cake was, and it took the entire length of the interview and a gentle reminder from me that he had yet to answer the questions for him to finally say "Curry Caramel." Apparently, they're developing a recipe for Curry Caramel Cake at Charm City Cakes (so it's not on the menu yet), and it's quickly becoming Duff's new favorite because it combines salty with sweet. I'm certainly intrigued about this flavor combination and wonder whether I'm brave enough to try and develop a recipe like that in my own kitchen! I had such a fun time meeting and interviewing Duff Goldman and I'm grateful to all of the people who made that opportunity possible for me. Thanks for the fun, Ocean Spray! Peace out!